Wowzers…2017…what a year! I feel as though this was truly the year of ~realizing stuff~ because so many things were uncovered. I don’t even know how to feel anymore, to be honest. Okay okay, let’s step back for a sec to November. How was yours? Was it every bit as Nine of Cups as you thought, meaning did you feel the overflowing energy of your intuition and/or subconscious? My subconscious had quite a bit to tell me via dream time, which led to quite a few days feeling foggy, confused, and extra emotional. Towards the end, I was happy to feel some clarity coming through, even if that meant that once the fog cleared, the landscape looked quite different than I remembered it. Was it the same for you? What’s in store for the last month of 2017? Let’s take a look! The Hierophant and I have had a very interesting relationship ever since I started learning the cards. I typically saw this card as a very stuffy, traditional, dogmatic figure. After my time in the School for the High Priestess, the Hierophant changed directions for me and the Starchild version goes in line with this new direction. The Hierophant is the Mystic of the deck. It’s religion, spirituality, and rules. But the Heirophant is also ritual, practice, beliefs, and morality. Have your morals been challenged? Have your beliefs shifted? Are you feeling more drawn towards ritual? I know I have been drawn to ritual big time this year, which makes me wish I lived in a place where I could have bonfires because I love a good burning ritual! The expression on her face in the card is that of intention. Her eyes gaze softly on something slightly out of view. The bright orb in her hand signifies what’s within our reach. To me, the orb represents the small steps we’re taking towards the bigger picture. How are we doing that? With intention. I like the structure of ritual because it gives me something to focus on. Not sure what to do? There are no limits! To start small, try a Full or New Moon ritual. It can be anything you want. I will share a little of mine for inspo but I will probably do a full post for each soon. 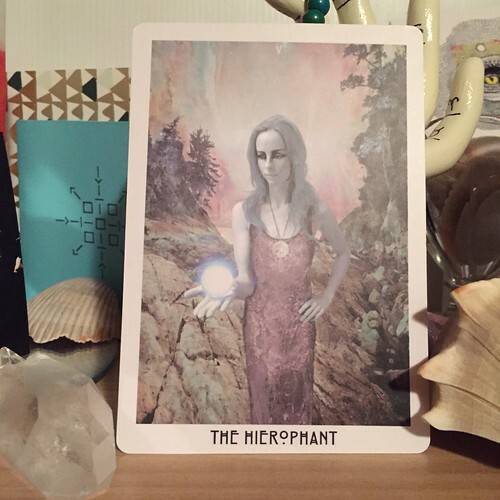 What I enjoy about the Hierophant is that there is also an element of linking up with like-minded people, which is always a wonderful feeling. Spending quality time with your close-knit group is very important now, especially during the holidays. Whether it’s your birth family or your chosen family, get together, enjoy each other, and create space to support each other. You can make those acts into ritual too! The other things I enjoy about the Hierophant is the message to keep learning and expanding. We won’t always know everything there is to know about everything but we learn, right? When I’m reading Tarot for people and they ask me how long I’ve been doing it for, I tell them something along the lines of “I’ve been reading for around [x] years but I’m always learning something new”, which I love about Tarot! And don’t you think the statement “We are all students of life” is also true? How can you put this into action? What new skills, ideals, perspective changes, etc…are you making/experiencing? My Full Moon ritual consists of lighting a white candle anointed with silver and blue glitter. The silver glitter signifies the light of the Full Moon while the blue glitter signifies the energy of Archangel Haniel. To call her in, I sing her name at my altar space and thank her for joining me. In the Candle Magick 101 class I’ve taken with (the amazing) Brandon Knight, he instructed us to sing the Archangel’s names to call them in and I’ve been doing that ever since! Next, I find a Tarot spread to match the energy I’m feeling. I like to use New Age Hipster‘s Full Moon Releasing Spread but she also has a Full Moon Magic Spread as well. Check out her other great spreads here! Once I have a spread picked out, I lay out my cards and journal. This helps give me a direction and energy to focus on. As a bonus, I pull a Moon Phase Ally card from the Keepers of the Light Oracle deck. This gives me a specific energy to work with during that Moon cycle (from Full to New). My New Moon ritual consists of lighting a white candle with silver, pink, blue, and green glitter. The silver, again, represents the light of the Moon – even though it’s covered, I still feel the silver glow, pink represents unconditional love (if I don’t have purple glitter), blue is for Archangel Michael, and green is for abundance. To call in Archangel Michael, I sing his name and thank him for being with me as well. I find a Tarot spread to work with as well. 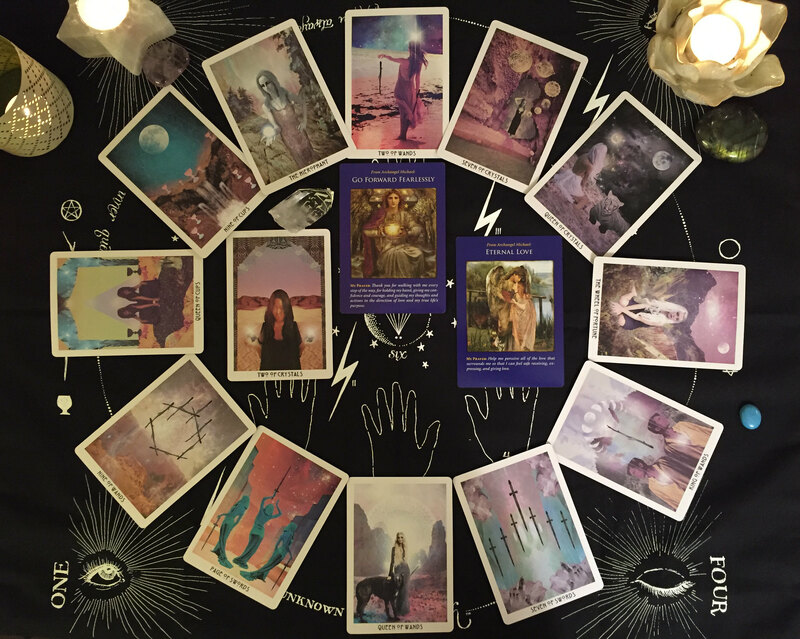 I like to use Ethony‘s specific New Moon Tarot spreads that can be found here or here. I also like to pull a Moon Phase Ally card for the New to the Full Moon. There are a few extra things in each ritual that are a little more personal, so I won’t share them but I hope that’s enough to get you started! Not into Tarot? Try an intentional cleansing/releasing bath during the Full Moon or making a master manifestation list during the New Moon. Need more inspo? Check out this post on The Hoodwitch about New Moon rituals and this post by the AstroTwins for New and Full Moon rituals. *If you’re in Atlanta* Check out the event schedule for Modern Mystic Shop and stay tuned for upcoming classes. You do not want to miss a class with Brandon! If you want an in-person reading with me, I’m there on Sundays from 3p – 7p. I’ll usually post a reminder on my IG. I’d love to meet up in person! How has your year been going? I’d love to know! Want a reading with me? Check out my store! I will be listing new options soon, so keep a lookout! If you want me to read for something that’s not listed, message me [balancethesescales@gmail.com] and I will be more than happy to work on something custom with you! If you’re in Atlanta, Georgia, I am doing walk-in readings at Modern Mystic Shop on Sundays from 3p – 7p. Modern Mystic Shop is located on the 2nd floor of Ponce City Market (near The Mercury). I’d love to meet up in person!